When I knew her, Nana smelled like roses and powder. She smoked pack after pack of Craven A cigarettes and laughed with the sound of those years of ashes in her throat. She sat in an armchair in the corner of the apartment that she shared with my grandfather, her cigarettes on a small, round table beside her with a lighter—those were the days of lighters—and an ashtray with a beanbag bottom. And a glass of Tang lemonade (yes, Tang made lemonade too). And the TV guide. The apartment’s balcony was trimmed with Nana’s geraniums, ugly, red, scraggly but lasting year after year. There were clumps of dirt in their pots and my little brother, my big sister and I would throw them over the balcony—the clumps, not the pots—and watch them shower onto the windshields of the innocent cars in the parking lot below. Nana was funny and gentle and soft. And strong as steel. She ran interference for us kids, over and over again, growing in stature each time she did. Every Sunday, all four of her boys and their families would crowd into that tiny overheated, under-ventilated apartment and she would make tea and we would sit for hours and hours. The boys—always “boys” no matter how old—were loud; they’d laugh and argue with my stubborn and handsome grandfather. My Nana and her four daughters-in-law, all of whom remember her with great fondness (unusual for daughters-in-law, I know), sat on the edges, talking and serving. Everyone smoked the air blue, so we kids hung like puppies out the window onto the balcony, looking for something to breathe. Nana would often bake for us, too, layering the icing sugar on thick in one corner of the cake for my brother who ate so much she wondered where he put it all and, I think, secretly admired him for his unstoppable appetite. Or she would make chicken salad sandwiches—heaven on white bread with the crusts carved off and the sandwiches cut into four triangles—with sweet pickles on the side. On dreary days, she taught us how to play gin rummy and for my sister, who was older and had a head inclined to games of strategy, she played cribbage. I loved Nana’s smooth, crepe skin, pink and soft as petals. I loved the wobble of her arms and her apron that covered her from shoulder to the hem of her dress. I loved her fuzzy blue eyes that swam behind her wire-framed cat glasses. I loved her feet—always sore although I didn’t know it then—and the small, embroidered slippers she wore in the house. They seemed to be from China and were very exotic in my child’s mind. I loved the high spool bed I shared with her when I was a young child. I would pretend to sleep while beside me her huge shadow kept me awake with its gentle snoring. I would stare at the painting of the Sacred Heart of Jesus hanging on the wall at the foot of the bed and hold my breath so I wouldn’t wake her. I loved that on those long ago Friday nights, when we arrived at their place after driving from Moncton, Nana and Grandad were eating dinner off folding tables in the darkened living room, watching wrestling on the small TV. Nana loved wrestling. I loved that too. 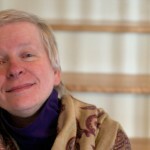 Based in Halifax, Linda is a writer and performance storyteller. She has a special interest in personal stories and the stories of the many communities in which we live. In addition to performing in a broad variety of venues, Linda works as an educator, facilitator and director. Over the past twenty-five years, she has performed in numerous venues including theatre, storytelling festivals and radio. Her stories have appeared in a variety of publications and Linda has also worked in film and video documentary production. Tessa May was born and grew up in Scotland and has made the west coast of Newfoundland her home since 1988. She received a BFA in Visual Arts from Grenfell Campus Memorial University of Newfoundland, winning the Award for Academic Excellence in Visual Arts. Tessa has exhibited her work in solo and group exhibitions and is the recipient of many awards, including the Franklyn Gallery Book Prize. 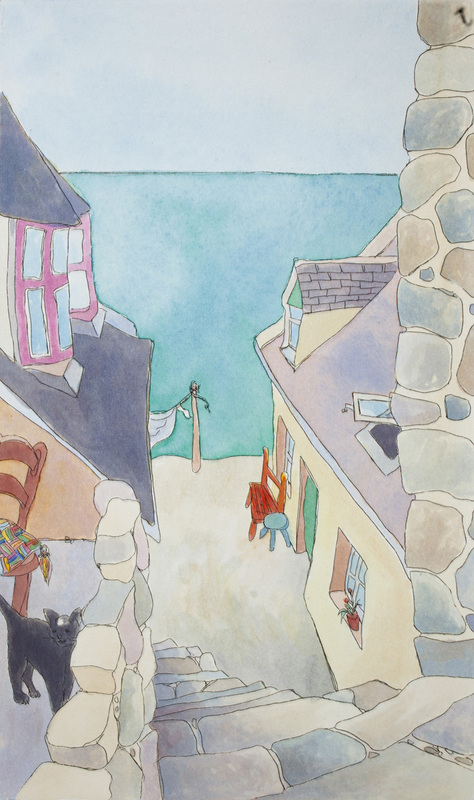 Her work can be found in numerous national and international collections, as well as the Newfoundland and Labrador Provincial Art Bank and the Canada Council Art Bank.